FORMER rugby player Glen Jackson refereed his first Test on Saturday, just two years after he was playing in the Premiership final for Saracens. The idea of such a thing happening with a professional footballer seems absurd, but why? Jackson’s experience of playing for the likes of Saracens, New Zealand Maoris and Waikato Chiefs has been utilised by rugby’s governing bodies and the former fly-half refereed Saturday’s Test between England and Fiji at Twickenham – the venue of his final match before retirement in May 2010. By his own admission, Newcastle United goalkeeper Steve Harper believes, at the age of 38, he is too old to consider refereeing as the next step in his career once his playing days are over, even though the Premier League no longer insists officials stop at the age of 48. Harper was often seen officiating on park pitches in the North East in previous years but as his family grew, his role as the man in the middle became less frequent. The experienced goalkeeper retains an interest in refereeing and sees no reason why football cannot follow the lead of sports such as rugby and fast-track players into the system. During an exclusive interview with GK Icon, Harper said: “I have often said that when players are coming to the end of their careers, why are there no opportunities for them to be fast tracked? And this was always met with resistance. Regardless of whether football’s governing bodies decide to opt for a fast-track system, Harper believes players whose careers are ended prematurely through injury should certainly consider refereeing. “I still do school games and the odd youth games but it is very hard to when you are an active professional,” Harper explained. “But I used to do a lot of refereeing on the weekends and Sunday mornings. “I have got three kids now so it would be difficult. As I said, I am approaching 38 and it is too late to go down that route now. The treatment of referees has been a topic of debate for some time and the foul abuse they receive, combined with the extreme scrutiny, is sure to deter many. Harper believes the media are often too harsh on officials and claims the standard of Britain’s referees are higher than anywhere else in Europe. He said: “The scrutiny they are under is incredibly intense. Referees only get one shot at a decision whereas we get to see it in 300 different angles and HD with slow-motion, And in some occasions opinions are still split despite all the technology. So refereeing is an incredibly tough job. “I was speaking to Mike Reily a few weeks ago on the Footballers’ Football Show and the scrutiny that they put themselves under from within their own organisation is also high through the dialogue they share and there is a real professionalism within the referees’ association. “I think the treatment they get in the media is particularly hard because they do strive to improve. Harper is enjoying life at Newcastle once again this season after being out of the reckoning during the 2011/12 campaign, with his five appearances all coming out on loan at Brighton and Hove Albion. 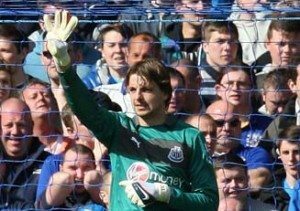 Newcastle’s longest serving player of all time has made seven outings already this season due to the Magpies’ Europa League campaign and injury to Tim Krul. “It has been nice to be back involved,” Harper admitted. “Last year I was not involved a lot but I had a good chat with the manager (Alan Pardew) on day one of pre-season and he said that if I still want it, then there might be an opportunity to play due to the volume of games coming up. Injury to his elbow meant Harper missed Newcastle’s last two matches but whilst Krul is undoubtedly Alan Pardew’s number one, the Europa League and cup competitions provide the 38-year-old with an opportunity to impress during what is the final year of his contract. Harper said: “I hope to get as many games as possible. I am hoping we can stay in the Europa League as long as possible. We have been in the quarter final and semi-final in the past so it would be fantastic to stay in that competition. “Unfortunately, we are out of the Capital One Cup but if we have a good FA cup run, a good Europa League run and keep doing well in the Premier League, then the more chance I have of playing in as many games as possible. 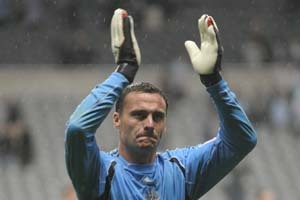 Thanks to the excellent website www.gkicon.com for sharing their exclusive Steve Harper interview with us, visit their specialist Goalkeepers site here.